Blizzard is addressing another common criticism of its Battle.net service by linking different global regions together for some hot Zerg-on-Protoss action. 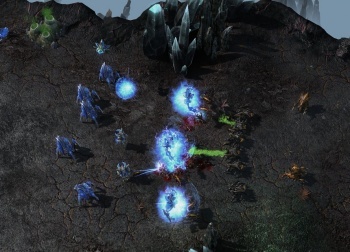 Last year's StarCraft II was a fantastic game in all senses: Its campaign was filled with brilliant mission design surrounding an engagingly cheesy space opera, and - after a slow start - its superb multiplayer has arguably become the most popular current e-sport around. Blizzard's Battle.net 2.0, on the other hand, faced considerable (and not unwarranted) criticism for offering inadequate features compared to its predecessor. While some of these criticisms - a lack of global and customized chat channels, for one - have been addressed, many still linger over what is otherwise a perfectly functional matchmaking network. Today, Blizzard that it would be addressing another one of the complaints by letting players from different regions get their StarCraft on. It's not the full cross-region play that some players have hoped for. Instead, Blizzard will be linking different regions together: North America and Latin America, the EU and Russia, and Taiwan and Korea (those poor Taiwanese). The reason for this, explained a representative in the official FAQ, is that the Battle.net data from these regions will still go through the same data centers, so players shouldn't see a noticeable increase in lag while playing. Players will also be able to use the RealID feature to add real-life friends in the linked regions, if they so choose. The linked regions will also share the same ranked ladder, so it ought to be easier to find someone of your skill level via the standard matchmaking tool. Presumably it also works with World of Warcraft, seeing as how the mega-MMO shares the Battle.net system with StarCraft. While this isn't quite as flexible as I (and others) might have hoped for, it's a good step - and one can only hope that it leads to full global play before too long. It's nice to see that Blizzard is trying to correct the flaws in its Battle.net service, even if it's doing so at its customary slothlike pace. How about an overhaul of the custom game browser next, huh? As someone who still plays SC2 multiplayer on a regular basis, my biggest concern might be the language barrier in team games. Quick, how do you say "I'm rushing Mutalisks" in Spanish?